Everyone has a doughnut story and this is mine. Mmmmm...yummy in my tummy!That doughnut is drooling delicious and I want it! 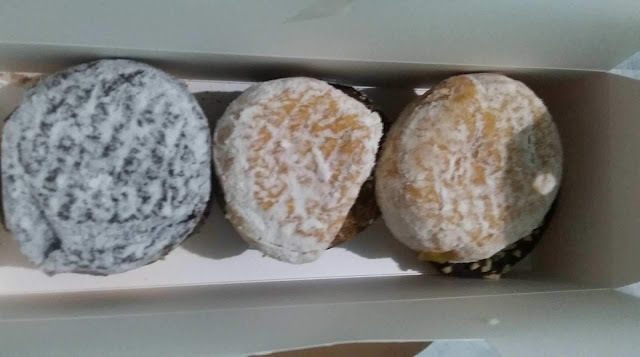 A single doughnut packs at 230-420 calories. You have to drink coffee or cola with it to make your day and a coffee cup with milk & sugar clocks in at 30 calories while a 12 ounce cola clocks in at 140 calories. So there goes that sweet looking doughnut, au revoir, hasta la vista,good bye. I love doughnuts and my fave partner to go with it is coffee. But since my stint with the dreaded S (stroke), I have to forsake it! Now comes my boy, handing me a box, the drooling delish doughnuts! This is for me? And he goes, "yes Mommy" why give me a box of doughnuts? he says it's mother's day, happy mother's day, Mommy! Aaaahh! I'm blown away, I feel emotional, very mommy like. All I can say was "thank you 'jay". But then the sister chimes in, it's not yet Mother's day, it's next Sunday! My son, sheepishly fired back, it's advance. Every day is Mother's day for us mommies, mamas, nanays, whenever we feel the love of our children. Life is sweet, it tastes like doughnut! As for the doughnuts, well I have an excuse to munch a whole piece!